Minnesota Gov.-elect Tim Walz named a former speaker of the Minnesota House as his transportation commissioner Tuesday and kept the budget chief who serves the outgoing Gov. Mark Dayton as he announced his first five cabinet appointments. Walz appointed former House speaker Margaret Anderson Kelliher to lead the Minnesota Department of Transportation and said Minnesota Management and Budget Commissioner Myron Frans will keep his job in the new administration. The Democratic governor-elect also named Maplewood mayor and former state representative Nora Slawik as chair of the Metropolitan Council. He promoted Alice Roberts-Davis from assistant commissioner to commissioner at the Department of Administration. And he tapped former Obama administration Department of Housing and Urban Development adviser Jennifer Ho to lead the Minnesota Housing Finance Agency. “These are accomplished Minnesotans. 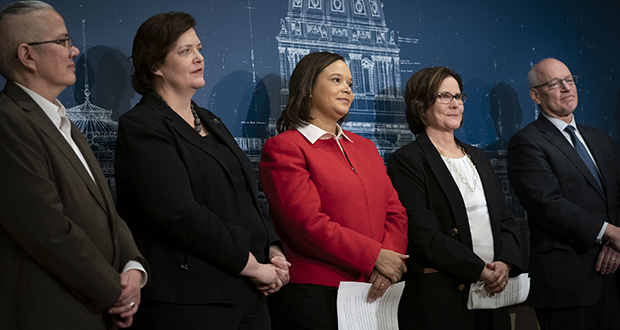 They’re experienced, proven leaders who will work tirelessly for the people of this state,” Walz said at a news conference, flanked by his new commissioners and Lt. Gov.-elect Peggy Flanagan, who helped oversee the screening process.Kelliher, who served 10 years on the main transportation committees during her 12 years in the House, will be tasked with delivering on Walz’s campaign promise to improve the state’s transportation system. She helped pass a major transportation funding increase in 2008 by persuading some Republicans to break with then-Gov. Tim Pawlenty to support a gas tax increase. Walz wants to raise the gas tax again to provide a steadier long-term funding source for road and bridge improvements, something Republican legislative leaders say is unnecessary when the state anticipates a budget surplus. Kelliher said passing a gas tax increase is “going to take some work,” and that she’ll have to work with lawmakers from both parties to win enough support. “So it will be a challenge, but a challenge that I’m up for,” she said. Frans served as revenue commissioner during Dayton’s first term but switched to the budget agency for the second. He was in the news two weeks ago as he projected that the state will have a $1.5 billion budget surplus going into the next two-year budget period, and said that state government’s rainy day fund to cushion against future revenue shortfalls has grown to $2 billion. The Walz transition team received nearly 500 applications for the 23 agency top spots, and he promised more appointments soon. His inauguration is Jan. 7. Cabinet members require confirmation from the Senate, where Republicans hold a one-vote majority. Walz said he’s “very cognizant” that he’ll need some GOP support for his picks, and said he’s been consulting with Senate Majority Leader Paul Gazelka. But the governor-elect said his cabinet in the end will reflect the values of the voters who elected him.